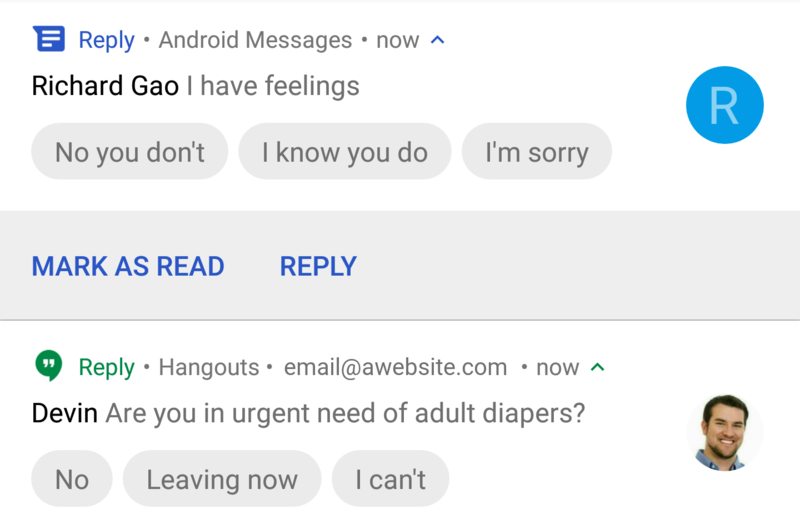 Earlier this year, Google's Area 120 — a division of the company that works on experimental products — pushed out a testing program for an app called "Reply," which added Allo-style, automatically generated smart replies to other messaging apps. That functionality has made its way into other Google apps, with native support for developer implementation of the feature in Android Pie. Based on that success, it appears Area 120 is sunsetting the old Reply app itself. Originally called a "very early experiment," Reply's days were pretty much numbered at launch since a standalone app wasn't the best implementation for the concept anyway. Since then, Google has incorporated Smart Replies into more apps directly, and it's even something developers can take advantage of in Android P.
Those that relied on Reply for their messaging needs won't immediately be in trouble. Reply will still continue to work for the next few months, according to Google. Smart replies via Reply may not have always offered the best recommendations, but the experiment was definitely a success. Everyone who sent this in.